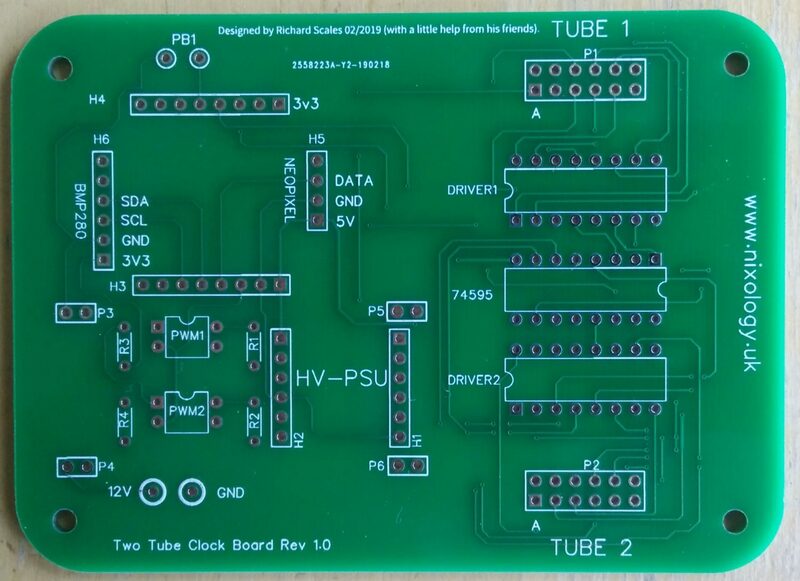 Some time ago, I noticed a comment that suggested there may be some interest in a two tube clock design as there were very few (if any) available. I took it upon myself to combine the idea with my desire to create a clock design based on the Arduino platform driving traditional Nixie Tube Drivers connected to a couple of Nixie Tubes and so the whole thing started crawling into existence. Firstly, the idea of displaying the time on only two tubes presents an interesting challenge. Several single tube clock designs will display the time (HH:MM) as H, H, M, M and then recycle H, H, M, M and so-on. The obvious first step is to show HH then MM and recycle – easy enough. However, I wanted to show more, much more! Not only did I want to display the Hours, minutes AND seconds, I also wanted to add the Day, Month, Year, Temperature and Pressure. That’s quite a lot of data to cram in to two digits in anything like a meaningful and understandable way. The Time would be displayed as HH, followed by MM which is then followed by an incrementing series of five SS. The cycle then repeats HH, MM, SS, SS, SS, SS, SS and so on. The date is displayed simply as DD, MM, YY, then the display reverts back to time. On the alternate minute, the temperature and pressure are displayed as: TT, PP (first two digits), PP (second two digits), it then reverts to the display of current time. In order to help distinguish between the various display types, under tube lighting changes according to the type of data being displayed. For example: Dark Blue for Time, Red for Temperature, Green for Pressure and Orange for Date. The electronics are fairly straight forward, I had a craving to utilise 74141 Nixie drivers, these are BCD devices which connect directly to the Nixies and require 4 input lines to select the desired digit for display. Using one of these for each tube it needed 8 GPIO lines from the controlling micro. It soon became apparent that there would not be enough lines available to drive the tubes and do everything else that was needed. 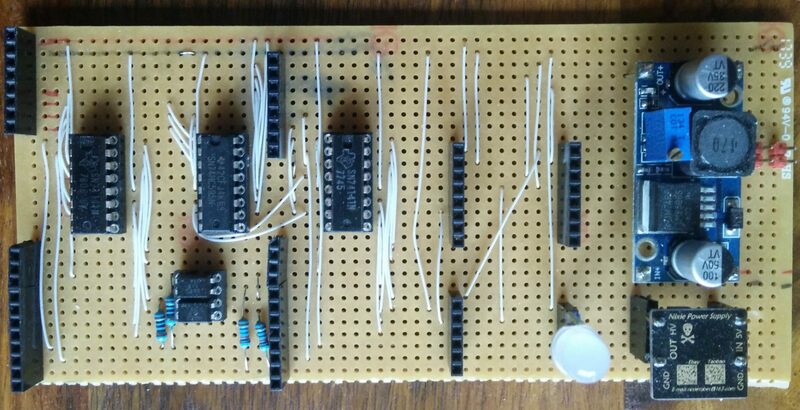 The solution was to utilise a shift register – 74595 – which took only 3 lines from the micro to generate 8 outputs, 4 of which went to each 74141 Nixie driver. Job done. Rather than simply switching the digits on and off, I wanted to fade them in and out. This was achieved by running the Anode supply (170V) through an Opto Coupler which was in turn driven by a PWM signal from the micro. Now the display can fade in and out as required by simply varying the PWM ratio on the micro. In order to display the temperature and pressure, some form of sensor was needed. I chose the BMP280 as I had used it elsewhere and only required two lines to control. Thus, the data was acquired and could be displayed on the Nixies. For the under tube lighting, given that I wanted to display many colours I chose to use ‘Neopixel’ style LED’s which are RGB LED’s that are controlled via a single data pin and can be daisy chained for multiple LED displays. The choice of Micro was dictated by the fact that I wanted the clock to take its time from the internet. The WeMos D1 Mini was selected which is essentially an ESP8266 module on a small breakout board with USB connectivity. It can be programmed from the Arduino IDE and consequently has rich library support. Gluing this lot together is fairly straight forward though it was still missing some essentials including some form of power to drive it and some code to make it all work. Whilst I have had some experience of electronics during my career, I had no ambitions to set about designing power supplies to generate 5V and more critically, the 170V which the Nixie Tubes need. So, rather than re-inventing any wheels, I elected to use a readily available Buck Converter to take 12V DC from a plug top power supply and provide the 5V that the micro and associated logic need. For the 170V I elected to use the NCH8200HV Nixie Tube PSU which is a super compact device from a reputable manufacturer (there are many cheaper clones of this device which I avoid now). It takes 5V in and puts out 170V, just what I needed. The whole thing was pushed together on some stripboard/veroboard and hooked up to a couple of Z566M’s et voila – a clock was born (did i gloss over the code bit? More on that later)! 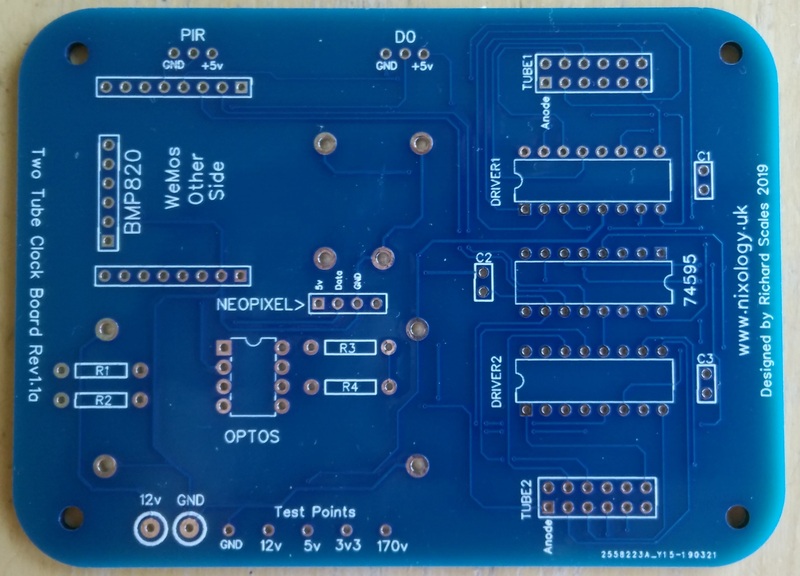 Having proved the concept it was time to move the design to a PCB. I had used KiCad in the past but was a little frustrated at the apparent complexity of generating footprints for custom components etc. 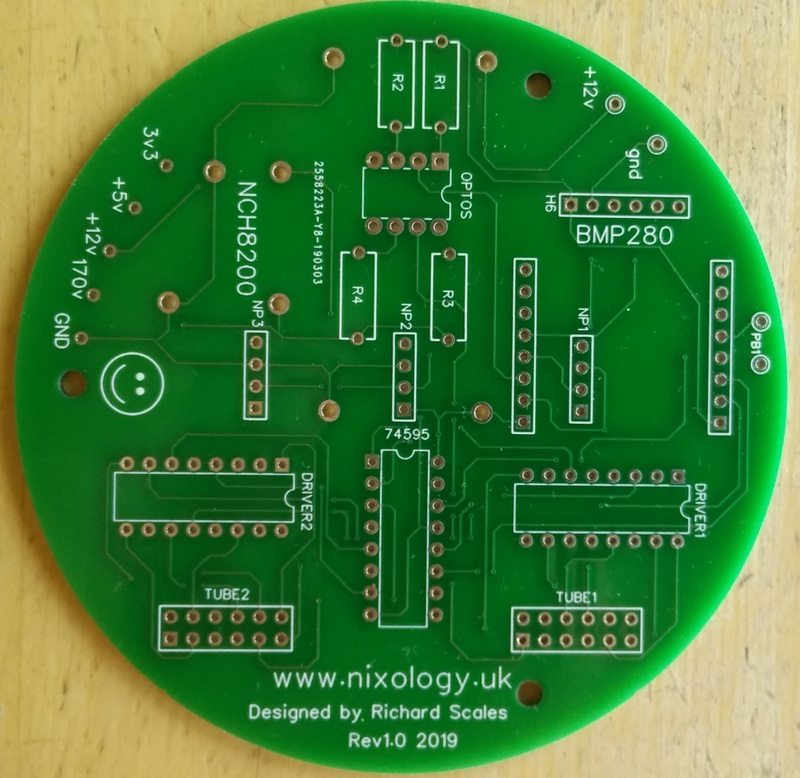 At around this time, Roddy Scott, a fellow member of my support group (Nixie Clocks Fan Page on Facebook) had shared some work he had completed using easyEDA which is an on-line PCB design tool. After some discussion, Roddy suggested that he might have some time to kill whilst waiting for some glue to dry on another project and that he could take my schematic and produce a PCB layout. This appealed to me as it meant my easyEDA learning curve did not have to be climbed. I am not sure if Roddy knew what he was letting himself in for though. 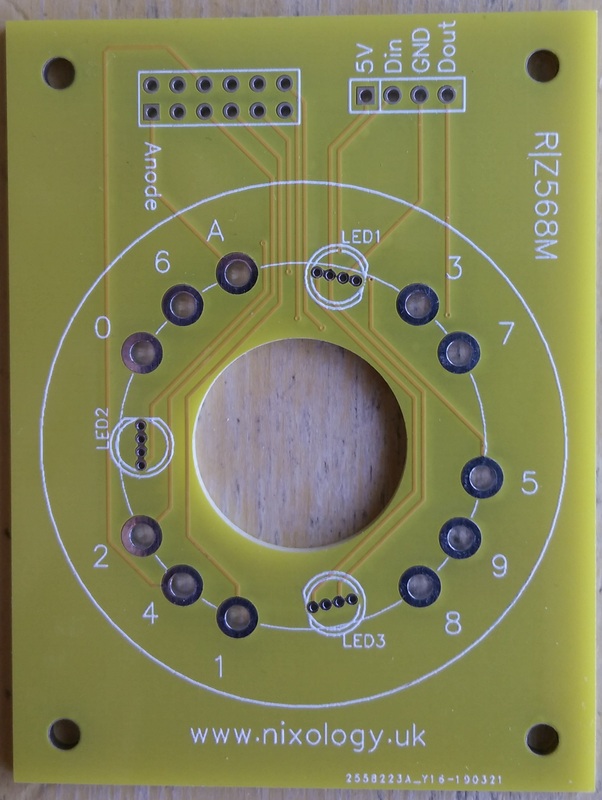 After a few iterations, a layout was tested so I took the plunge and ordered a batch of PCB’s. 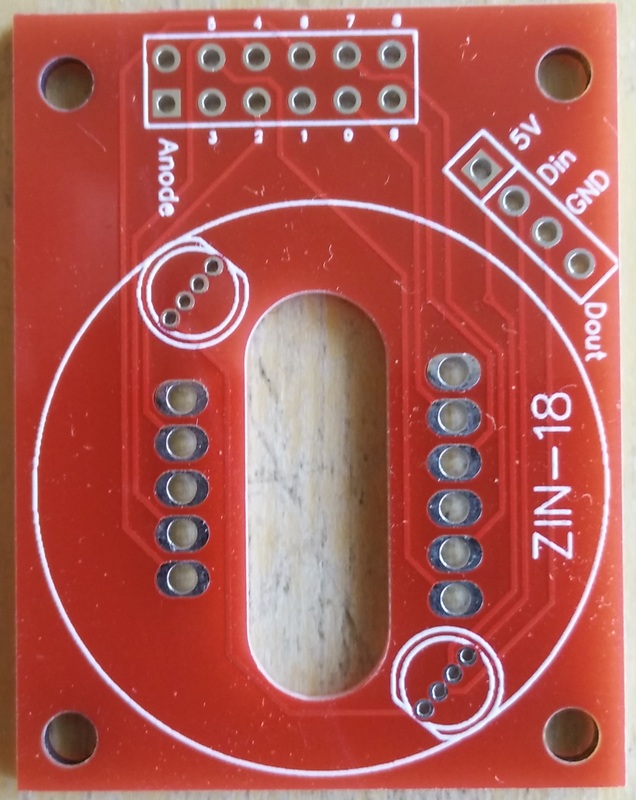 The initial design goal was to produce a board which would then connect to the Tube Cells that were already available from P V Electronics so the 2 x 6 pin header arrangement was adopted. Subsequently I designed tube cells for other tubes. The idea being that the tube cells would connect to the clock board via lengths of ribbon cable with IDC connectors at each end. At the same time, and for testing purposes, small tube cells could be plugged directly on to the board. 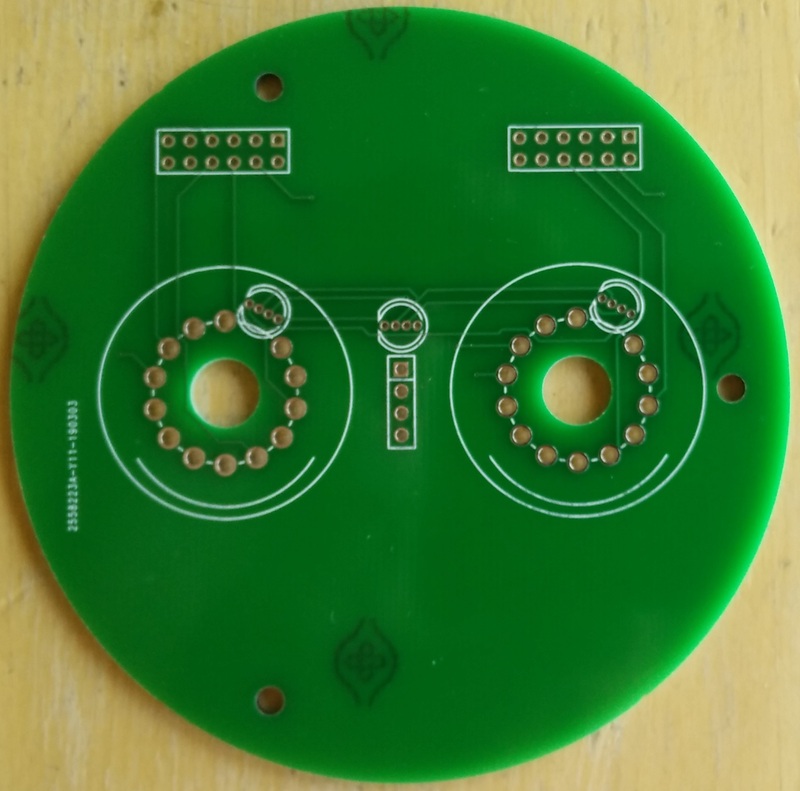 Roddy came up with another solution which comprised of a circular board for the main electronics and another circular board which plugged in on top and had sockets for either IN-18 tubes or B-13B (for Z566M, GN-4P etc). This would allow a complete standalone version of the clock which could then be mounted in smaller circular case designs. At around this time, the name ‘Gemini’ was adopted. Each new part of the code presented its own series of challenges, all of which have (at this present moment!) been overcome though each time it has got to the point of being ready to roll, a new idea springs to mind – and so the process continues. There are still a few ‘wouldn’t it be nice if….’ items on the list – however, these will require more learning. Summer is coming and the time available for such tinkering is diminishing!